Veteran reliever Sergio Romo is zeroing in on an agreement with a yet-unreported club, tweets Jon Heyman of MLB Network. The 35-year-old was said a couple of weeks back to be drawing heightened interest, and it seems he’ll soon make a decision on his next club. Heyman notes that Romo is looking at a one-year deal, which quite likely indicates that he’ll be inking a Major League pact when all is said and done. That much could’ve been largely expected early in free agency, though with Spring Training looming, there do figure to be some surprising minor league deals agreed upon. Romo helped to pioneer the “opener” role with the Rays last season, making five starts in that still-developing role. He had three successful outings and one ugly showing as an opener but turned in a 3.88 ERA with a 68-to-16 K/BB ratio in 62 2/3 innings as a more conventional reliever. Romo nailed down 25 saves for Tampa Bay and turned in a 13 percent swinging-strike ratio and a 33.1 percent chase rate. He’s never been a hard-thrower but never struggled to miss bats, making him a nice veteran addition on what should be a rather affordable deal. Jeremy Hellickson and the Nationals are in talks about a potential reunion, tweets Craig Mish of SiriusXM. Hellickson, 32 in April, made 19 starts for Washington last season and was generally effective. In 91 1/3 innings, he averaged 6.4 K/9 and 2.0 BB/9 with a career-best 45.9 percent grounder rate en route to a 3.45 ERA. Metrics like FIP (4.22), xFIP (4.27) and SIERA (4.33) all felt Hellickson benefited from a bit of good fortune but was still a useful big league arm. The Nats have one of the strongest rotations in MLB, with Max Scherzer, Stephen Strasburg, Patrick Corbin and Anibal Sanchez comprising the top four. Joe Ross is projected as the No. 5 and will have competition from former first-rounder Erick Fedde, but both righties still have a minor league option. A big league deal for Hellickson would likely put him into the rotation. The Giants and Athletics are among the teams with some level of interest in free-agent left-hander Gio Gonzalez, tweets Bob Nightengale of USA Today. New Giants president of baseball ops Farhan Zaidi has waited out the market to find palatable one-year contracts with Derek Holland and Drew Pomeranz already, so perhaps there’s a hope that the same can be accomplished with regard to the 33-year-old Gonzalez. San Francisco currently projects to have Madison Bumgarner, Dereck Rodriguez, Holland and Pomeranz in the rotation, with the fifth spot likely going to either Jeff Samardzija or Andrew Suarez, depending on Samardzija’s health after an injury-ruined 2018 season. Ty Blach, Chris Stratton and Tyler Beede are among the other rotation candidates on the 40-man roster. Meanwhile, there’s a clearer path to rotation innings in Gonzalez’s old Oakland stomping grounds. It’s not the first time the A’s have been connected to Gonzalez this winter, but the interest is nonetheless notable, as the last link between the two sides came well before the Athletics’ signing of Marco Estrada. The Nationals announced today that they have activated righty Jeremy Hellickson from the disabled list. He had been sidelined since suffering a wrist sprain during his last outing on August 15th. It’s too late now for Hellickson to help the Nats crawl back into contention. And he wouldn’t be eligible for the postseason if moved via trade. He will, however, add another arm to the mix while showcasing showcase for his own upcoming free agency. Hellickson has neared the open market under quite different circumstances twice already. He received a qualifying offer from the Phillies after a strong 2016 campaign, but pitched poorly in 2017 after taking the hefty one-year deal. That set up a disappointing first foray into free agency, when he settled for a minors deal in D.C. in the middle of Spring Training. Hellickson’s current contract came with only a $2MM base salary, though it did also include up to $4MM in incentives. Details on that clause have not yet been publicized, though it’s certainly possible that new thresholds could still be within reach. To this point of the season, Hellickson has thrown 88 1/3 innings over 18 starts. That’s an average of less than five frames per outing, though that usage was by design rather than a reflection of poor pitching. In fact, Hellickson has thrived in this carefully controlled role, working to a 3.57 ERA with 6.5 K/9 against 1.9 BB/9 along with a career-best 46.2% groundball rate. In most ways, Hellickson looks to be much the same pitcher he always has been. By mostly eliminating his exposure to opposing lineups for a third time in a given outing, though, the Nats have lopped off his typically dreadful results in such situations. Perhaps that approach best explains the good year; of course, he’s also allowing only a .254 BABIP and is outperforming the expectations of ERA estimators (4.25 FIP, 4.20 xFIP, 4.27 SIERA). What that’s worth on the open market remains to be seen. But Hellickson has surely thrown well enough to warrant a deal that comes with a 40-man spot. It should help that he’ll have a chance to tamp down any health questions by returning for the last few weeks of the season, even if that means working out of the bullpen. The Brewers are “pursuing” veteran Nationals lefty Gio Gonzalez, according to Ken Rosenthal of The Athletic (via Twitter). While the Nats have pulled back their relief arms, they are willing to consider scenarios involving Gonzalez or Jeremy Hellickson, per ESPN.com’s Buster Olney (Twitter link). It’s an interesting situation for both ballclubs. The Milwaukee outfit is obviously turning over all stones to get a rotation upgrade, as Bob Nightengale of USA Today tweets. And the Nationals still appear to be dangling some veterans even after deciding not to move Bryce Harper. It’s not immediately clear why the D.C. organization is willing to listen on those two hurlers. The team doesn’t seem to have replacement rotation pieces lined up. While Gonzalez is expensive ($12MM salary), Hellickson is quite affordable ($2MM base salary with up to $4MM in incentives), so they aren’t quite on equal footing as rental pieces. Perhaps it’s conceivable that the club is angling to add a different starter, though we’ve seen no particular recent rumors to that effect. Many of the free agent mistakes that have plagued the Marlins in recent years weren’t the fault of president of baseball operations Michael Hill, a source tells Barry Jackson of the Miami Herald. “People without full accountability had more power under Jeffrey [Loria]” than Hill did, the source said, and Jackson’s piece details some of the thought process that led to the Marlins’ ill-fated signings of Wei-Yin Chen, Martin Prado, Edinson Volquez, Jeff Locke, Brad Ziegler, and Junichi Tazawa. Hill’s lack of culpability in these signings could explain why he kept his job once the Derek Jeter/Bruce Sherman ownership group took over the team last year, amidst a general housecleaning of former front office staff. Hill was already under contract through 2020, though that doesn’t appear to have been a major factor in his retention, since the team has eaten quite a bit of salary in letting go of other executives. According to Jackson, roughly $18MM in total salary was owed to departed front office members Mike Berger, Jeff McAvoy, Marc DelPiano, and Jim Benedict through the 2020 season. Jeremy Hellickson left during the first inning of today’s game due to a right hamstring strain. MLB.com’s Jamal Collier was among those to report that Hellickson would undergo an MRI tomorrow to determine the extent of the injury. Signed to a minor league deal last offseason, Hellickson has delivered tremendous results over his first 43 1/3 innings, posting a 2.28 ERA, 7.06 K/9 and 5.67 K/BB rate. 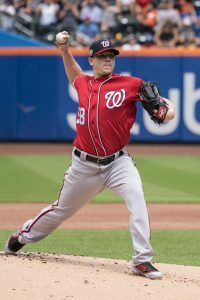 The Nationals don’t need a fifth starter until June 19 thanks to multiple off-days in the schedule, though Hellickson is hopeful of avoiding a DL stint since he noted that his current injury isn’t as painful as another hamstring strain he suffered a few years ago. The Mets are expected to activate reliever Anthony Swarzak from the disabled list on Tuesday, Newsday’s Tim Healey reports. Swarzak, who signed a two-year/$14MM free agent deal last winter, made just two appearances for the team before hitting the DL due to an oblique injury in early April. In a chat with NBC Sports Philadelphia’s Jim Salisbury and other reporters, Phillies scouting director Johnny Almaraz implied that the team will look to take a college player with the third overall pick in tomorrow’s amateur draft. Alvarez agreed with the general outlook that the draft is deep in quality college talent, noting “I see a lot of clubs moving in that direction where we’re going to try and get on these college players pretty quickly.” Oregon State infielder Nick Madrigal, Wichita State third baseman Alec Bohm, and Florida pitcher Brady Singer have all been noted as potential picks for the Phils, and Salisbury believes one of the trio will be the choice, barring an unexpected development (like the Tigers passing on Casey Mize as the first overall pick).